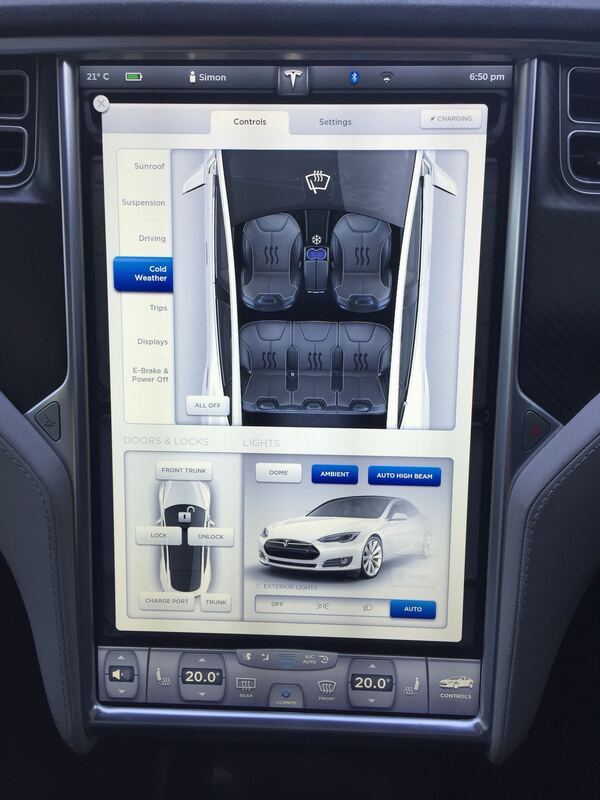 When I took delivery of my Tesla Model S, I knew that it had a lot of cool hardware that was slated to be enabled progressively in future software updates. Forward looking radar, steering-wheel control servos – all sorts of nifty things. This morning, my son Felix found out about a very cool piece of hardware that has been quietly built into cars manufactured since late last year that include the ‘cold weather’ (or ‘subzero’) package. He was turning on the seat heaters (something he has a tendency to do – especially when I’m not looking), and he happened to try tapping on the cup holder icon shown on the same control panel. What he discovered, to our mutual surprise, was that the model S cup holders have heating and cooling hardware installed, so your Model S can actually keep your coffee hot or your soda cool! This looks to have been enabled in the recent Version 6.1 software update, although its definitely not in the release notes (I checked!). To turn the drink heater/cooler on, you just bring up the ‘Cold Weather’ page and tap on the image of the cup holders. The cup holders cycle between three states – off, heating, and cooling, as shown on the screen shots below. Heating mode brings the cup holders up about 45-50 degrees Celcius, and is indicated with a red icon when active, just like the seat heaters. Tap the cup holder image again to engage cooling mode. This brings the temperature of the holders down to around 5 degrees Celcius. When actively cooling the on-screen image is blue, with the addition of a small ‘snowflake’ icon. Tap once more to turn off. While the heating function looks to be based on conventional heating coils, the cooling is being done with a solid state Peltier Effect cell. Specifically, Tesla look to have incorporated a pair of TEC-12703 solid state Peltier Effect cells supplied by EVERREDtronics Ltd in Shanghai. These are cost effective, silent, and reasonably energy efficient. I’ve seen this sort of thing on sale as a bolt-on accessory to plug into a USB port, but this is the first time I’ve ever seen one built directly into a car by the manufacturer. If you have the cold weather package installed, why not try it out for yourself? 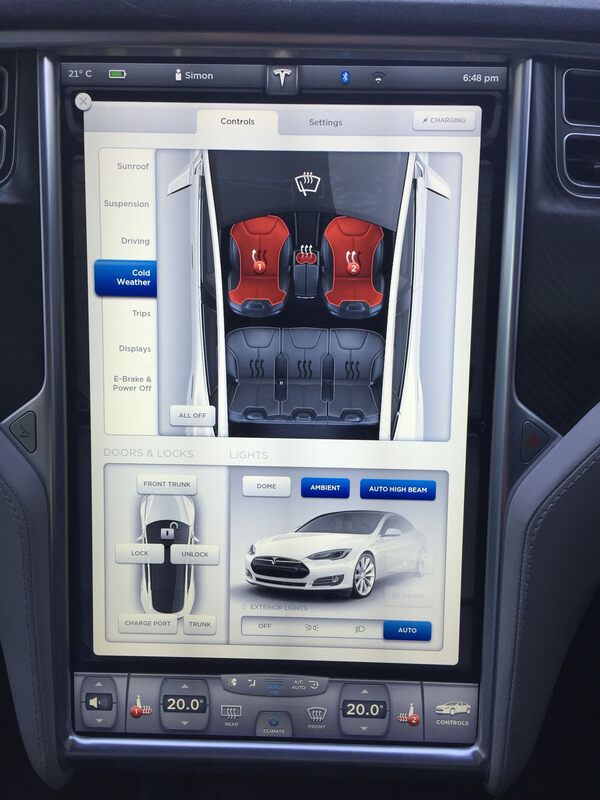 This entry was posted in electric cars, electronics, reviews and tagged cooling, cup holder, heating, model s, tesla motors by simonhackett. Bookmark the permalink.